As an employer, you might have the best of infrastructure, most modern facilities and everything else which you would require to carry out your business operations. Do you feel these would suffice? Let me tell you something, in most of the cases, these element acts as supplements, what actually makes it happen is your human resource. In today’s world, there is no lack of competent and skilled employees; you need to know where to find them. This article will provide an insight into this aspect. What do you Mean by Good Employees? The meaning of “good employees” is open to interpretations. However, there are certain basic parameters which are used as a scale to measure how good a particular employee is. A good employee is someone who would act towards the benefit of the organization and would help it attain its goal. This is the bottom line. What are the Signs of Good Employee? The hallmark of a good employee is his punctuality. He would not only be at the office on time, he would even meet the set deadlines. He would be reasonably obedient. Of course, you cannot expect anyone to 100% comply with the obedience level; however, good employees would be handful in this regard. He would be passionate towards his job. He would love doing what is assigned and would seldom complain about the lack of resources and other aspects. He would take the initiative and manage the shortcomings if any. This is one of the important signs. A good employee is not only someone who can get work done for you; he is a person who has the skills and the capabilities to mobilize the human resources within the organization. A good employee is someone you can depend upon. He would be a responsible individual and would give his 100% to live up to your expectations. You would feel being in safe hands when these individuals are around. If someone is not a good communicator, no matter what level of expertise he has, he is short of being a good employee, so to speak. One of the most important traits of an effective employee is his communication skills. He should be excellent when it comes to expressing himself or representing the viewpoint of his company. He is the one who would be at the forefront when you need to send across any message to your business associates, competitors or other employees. In the absence of effective communication skills, one cannot be deployed as a representative of the company. One common feature which can be associated with all these traits is the fact that none of these are related to the level of expertise or skills of an individual. These are all personality traits and have nothing to do with the technical know how of an individual. 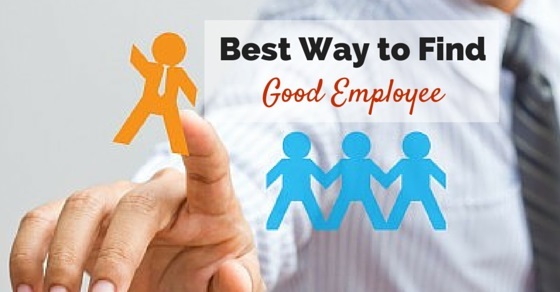 Why is it Important to Employ and Retain Good Employees? You need to have a solid employee base in order to tackle all sorts of situations. The net worth of your company depends on its performance. In order to increase the brand value, you must have the best employees working for you. The overall success of your business is determined by quite a few factors. Your man power, rather, the quality of your manpower is one of them. Now that you know about the importance of hiring and retaining good employees, what are the traits which can help you recognize the best ones around, it is time you are informed about the ways you can find some of the best employees for you. The following section will provide some insight into this topic. This is an internal source which is used by most of the organizations to meet their demand for manpower. The existing employees who have been working for quite a while knows about the work culture and the job profile. Therefore, they are in the best position to refer the best man for the job. Candidates often send job applications. Quite often they are kept aside. You can certainly refer to those pushed applications and then shortlist among them. It is true, that you will not get a clear picture about the candidate from his resume and application; still, you will get an idea on what he can offer you and how effective might prove to be in the future. Pushed applications are very useful when it comes to meeting the sudden manpower crisis. This is one of the traditional ways to hunt for employees. However, there is a chance that you might end up receiving applications which doesn’t suit the job profile. Therefore, it is very important to specifically mention about what you are looking for, your expectations and what you don’t want of an individual. In this way you will narrow down the criteria and your chances of getting candidates who are fit for the job. These days, you can get any profile you want within a matter of a few days. Thanks to the innumerable job agencies who are operating in the market. However, talking about hiring good employees means something else. Here, you will be looking for certain characteristics in a candidate. Therefore, when you approach any job agency, make sure to explicitly and categorically mention about your requirements. They would ensure that you got the best recruit which matches your expectations and requirements. This is a relatively new concept. Many big organizations participate in job fairs where they spot the best talent available, conduct interviews, shortlists the candidates carry our training sessions and then select the best out of the lot. Job fairs have become a very popular option for these companies as they can get hold of multiple candidates at the same time under the same roof. This is also a very common practice among the MNCs and other big companies. They basically hunt down the best of candidates from different colleges and universities. This is a very effective way to get hold of competent and serious individuals. Since they are fresh graduates, they have their own aspirations and are looking forward to prove themselves. If these young groups can be trained and nurtured properly, they can certainly turn out to be real assets for a company. Hiring employees doesn’t necessarily mean you are looking for new faces. What it means is that you are looking for individuals who would fit the job profile and would deliver to the best of his abilities to help meet the organizational goals. Therefore, you can certainly look among your existing employees and see if any one among them meets your requirements. The chances that you might find what you are looking for is quite high. Once you have found one, you must train him and get him prepared to meet the new challenges. You must ensure that the individual has been prepared to get the job done to the best of his abilities. Being an employer, you too have few duties to perform. Remember, employees are as good as employers. Therefore, in order to get the best, you must prove to be at least a good employer. As already mentioned, if you are looking to hire good employees, you must make your presence feel as one of the credible and honest employers. You may ask for any number of employees with any number of skill sets. But the question is, why would anyone approach you? The answer to this question is quite simple. They will show interest in you only if they find that you have something special to offer. It is not only about the salary or the monetary aspect. It goes much beyond that. Good employees always look for opportunities to improve themselves and to keep on adding to their skill levels. They want fair treatment and of course, a reasonable package. If you can’t offer either of these, then you better don’t expect for what you are looking for. If you lack any of these, you must get your acts together and try to fill up the gap. These days, you can find any online job portals which have bulk different types of candidates with different qualification, skill sets and experience level. These online portals have made things very easy for the recruiters as you can look for precisely what you want. However, you cannot hire someone based on his candidature. You must test him in every possible way to make sure that he can offer you what you expect of him. It is very important to remember that it is not enough to get hold of candidates. How would you know if they have the attitude, skill sets and other traits which have already been mentioned about? In order to get a clear idea, you must conduct an effective interview session. At times, there can be multiple sessions where candidates are being short listed. This is exactly how big companies and MNCs approach their process of recruitment. At the end it can be concluded by saying that there are multiple options available to you where you can seek for good employees. However, as an employer, you too have certain roles to play in order to get what you are looking for. Previous articleHow to Overcome Lack of Management Experience?